Boy Scouts are so deeply ingrained in American life that it’s hard to imagine our country without them. But changes their leadership is considering may well lead to that unfortunate outcome. Over the last few years, the Scouts’ policy of not allowing participation by leaders or scouts who are practicing homosexuals has come under increasing attack. Boy Scouts of America (BSA) can no more hide from the rising tide of sexual orientation politics than any other national institution. The controversy seemed to resolve in a key 2000 United States Supreme Court ruling which allowed the policy to continue through the First Amendment’s guarantee of freedom of association. As recently as six months ago, the BSA National Executive Board reaffirmed the ban on homosexuals. But since then the issue hasn’t gone away; in fact, it’s grown more intense. Major corporate donors have withdrawn their financial support in protest over the policy—Merck, Intel, UPS and many chapters of the United Way being just a few. On the other side, grassroots scouting leadership has by and large voiced their support of the policy. Even the last presidential election weighed in, with both President Obama and challenger Mitt Romney voicing their opposition to the ban. All of which led the Executive Board to re-open the issue last month at their annual meeting. What they decided, though, has pleased no one and actually led 2.7 million Boy Scouts deeper into the swamp. The 70-member Executive Board proposed a resolution that would essentially remove any mention of homosexuality from scouting participation. BSA as a whole would have no position on the issue. Each local sponsor would make the decision whether practicing homosexuals would be allowed into their troop. In other words, the Executive Board’s recommendation was to try and sidestep the issue altogether. Instead, it would be the responsibility of the sponsoring agency—church, organization or club—to determine for itself whether to allow practicing homosexuals to participate in a troop. What the Executive Board tried to do was to take the monkey off their back and place it on the back of the sponsoring agencies. The recommendation was to have been voted on February 6 by the Executive Council, but the outcry has been so intense that everything has changed. The new plan is to have the larger National Council (1400 members including many more local leaders) make a decision at their May meeting. In the meantime, scouting hangs in the balance. BSA’s standing policy on homosexual participation was on firm legal ground and had the support of the great majority of local troops. The Executive Board didn’t have to move in the direction that they did, unless declining corporate donations were putting more pressure on them than has been reported. But the board acted—or tried to act anyway—and placed scouting in a precarious legal and moral position. This capitulation and the abandonment of the B.S.A.’s longstanding policy will, in the end, please no one. The new policy is a half-measure that amounts to cowardly moral evasion. No group can remain divided on a question of such moral importance and urgency. Homosexual conduct and relationships will be condemned or celebrated. There is no middle ground. Back in 2004, the B.S.A. 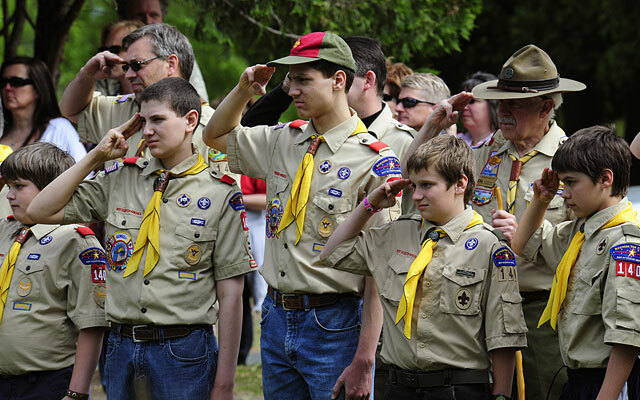 maintained that homosexual conduct is “inconsistent” with the “morally straight” requirement of the Scout Oath. Now, the B.S.A. will claim to have no position whatsoever on the issue. This fails the test of seriousness. Those who believe that homosexual conduct is sin cannot endorse the new local option policy, and scouting units that hold to this position will inevitably be marginalized. Those who celebrate and demand the normalization of homosexuality, on the other hand, cannot and will not be satisfied with a half-measure like a local option. The predicted response now comes in the form of an editorial in the January 30, 2013 edition of The New York Times. After pointing to the B.S.A. policy proposal as an indication of the nation’s moral shift on homosexuality, the paper then complains that the policy “falls far short of the clear and strong renunciation of anti-gay bigotry that is called for.” That will be the emphatic judgment of the cultural left and of gay rights activists. It is also inevitable, given the nature of this controversy. The new policy, says the Times, is “an unprincipled position” and a “partial move” that “should hardly satisfy” those demanding the full inclusion of homosexuals at every level and in every Boy Scout unit. That is an understatement. The “halfway policy” will also invite the obvious realization that the Boy Scouts of America is now abandoning what the group claimed was a “core” belief and conviction just thirteen years ago. The new policy reveals what will stand at the core of the Boy Scouts of America’s national policy — a vacuum of moral conviction. This will not only fail the test of litigation, it will fail the test of moral sense. On this much, both sides in the controversy over homosexuality are agreed. The Boy Scouts of America will destroy themselves by this policy change. If they will not believe that argument when it comes from the “vast majority” of parents, or from the churches and faith-based groups that sponsor the greatest number of Boy Scout units, perhaps they will hear the argument now coming from the editors of The New York Times. I love Boy Scouts, and our church like many others in our community count it an honor to sponsor a troop. At our annual Scouting Sunday, just a couple of weeks ago, our congregation was thrilled to see the scouts in their uniforms helping to lead worship. I’m deeply grieved at the pain and uncertainty this controversy is causing to Boy Scouts. Even while their national leadership continues to equivocate and play politics, at the local level, where things really matter, men of character continue to embrace the scouting philosophy that has helped so many for so long and impacted our nation so positively. May their tribe increase. In the meantime, our church like so many others will continue to support this group. We deal with so many things today where decisions on the national level seem so contradictory to what we believe on the local level. And it’s vital that, here where we live, with our neighbors and friends and church members, that we continue to encourage these faithful men and boys in their drive to be better people and citizens of our great nation.